Gross but true, dead skin build up on your face not only ages you but it also clogs your pores. Seriously. While a basic scrub can get the job done, for me I find them to be too irritating and can cause more harm than good. 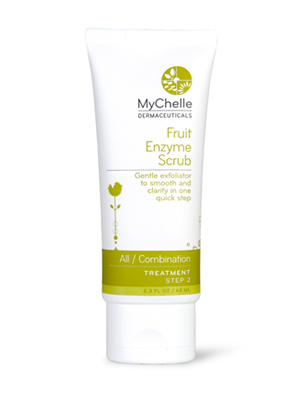 I really like this scrub by MyChelle, not only is it super gentle using Jojoba Beads and refined Bamboo Stem Powder for exfoliation but it also has fruit enzymes to dissolve away the rest of that nasty skin dullifying, pore clogging residue. I’ve been using this scrub once or twice a week for the past couple of weeks and my skin really loves it. Not only is my skin much clearer, but its more even and super glow-y. It helps my make-up go on much smoother and I’m convinced it allows my moisturizer and serum to absorb more easily, leading to generally a much better clear skin situation. I’ve tried some Mychelle products, would be interested in trying this one! Sounds pretty nice. It’s great and really not harsh. I really love all of their products- they work SI well!